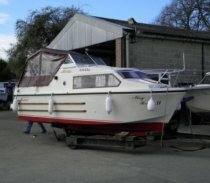 At Crosshall we can carryout all types of boat repairs and maintenance. Crosshall marine services and workshop are based in St.Neots Cambridgshire on the River Great Ouse. Our large workshop can house craft up to 33ft for undercover boat offers space to carry out undercover boat maintenance and repairs. We have on-site lifting equipment which can move craft up to 10 tonnes. and the use of our slipway. Our specialised area is GRP River cruisers. Our experienced and highly skilled team of staff carry out the full range of marine and boat maintenance, engineering, repairs and refits, preparation and annual servicing. All our staff are experienced in their fields, and we pride ourselves in offering our customers the best quality service. We carryout work on behalf of major insurance companies including Haven Knox-Johnston, GJW Direct and Newton & Crum. 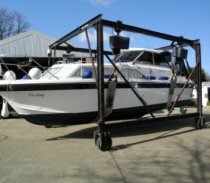 Boat hard-stand is available if you wish to carry out your own maintenance. Please complete the contact form or telephone about any requirements.